How to use a dive watch? What to Look for in A Dive Watch? Making Smart Choices: How to buy a dive watch? What kind of depth do you need? It can be hard to find a good dive watch without taking out a second mortgage on your home. High-end options an run you in the tens of thousands, and are out of the reach of many divers. And some of the cheaper options or won’t last you through a dive. Seiko are known for making some of the most affordable dive watches without compromising on style or features. The Prospex PADI Solar is no exception. It is produced alongside the international diving organization, PADI. It’s meant to give you everything you need in a dive watch, all at an affordable price. And that’s exactly what it does. The Prospex PADI Solar features a classic and elegant dive watch design, with a bold blue face and an elegant dial on the side of the body. The stainless steel case is well-polished and bright without being blinding. The watch has a fairly large profile, but feels and looks light on your wrist. If you are using it as a day-to-day watch, it’ll be on the bigger side, but still perfectly comfortable. If you buy this watch strictly for diving, you’ll get the perfect style. But the clean and elegant design means it’ll look great on your wrist before and after your dives. The solar quartz movement is designed so that you never have to worry about changing a battery. Once charged, it keeps going for up to 10 months. And the battery is meant to last for decades, so that you don’t have to open the case. This makes a get practical option for those that won’t wear it for long periods, but need it to be ready to go for a dive. It can even charge on your way to the dive site or beach, so you you’ll never have to worry about the movement stopping in the middle of your dive. The movement is accurate to plus or minus one second a week. There were no issues with the movement throughout any part of the testing, and it was well within its range of error. Unlike other kinetic options, there is no maintenance with the movement. All you have to worry about is getting it some sun every now and again. The face is easy to read, and has excellent visibility even in low light conditions. There is a mineral crystal over the date that helps slightly magnify it, so you don’t have to strain your eyes. The face has great depth, so it never feels crowded, and every element stands out. The Prospect Padi Solar is rated waterproof up to 200 meters, so it is perfect for nearly any dive. There were no issues with water leakage or damage throughout any of the testing. The diver’s bezel is unidirectional, and allows you to track time in 60 minute increments with ease. It moves with a nice clicking noise, and is designed to resists movement underwater so that you don’t accidentally shift it during your dive and lose track of time. The metal bracelet is comfortable and does not rub against your wrist, even with days of continuous wear. The metal clasp is simple, but it stays in place no matter how much you waive your wrist around. And it fits wrists of different sizes. The watch also has excellent durability. There was no issue with water over repeated use. The crystal case is scratch-resistant, and was unmarked even after scraping against rock and other hard surfaces. The bezel had a few small scuffs, but they were rather minor. Overall, the Seiko Prospex PADI Solar offers reliable performance in just about every category. The build is excellent, with durable materials that are scratch-resistant and won’t wear over time. The mechanism is accurate, with easy charging that means you’ll never have to worry about your battery. The bezel gives you great grip when you’re underwater. And the face is always easy to read, no matter the light conditions. It performs like a watch that costs hundreds more. The Seiko Prospex PADI Solar dive watch offers full functionality in an affordable and stylish package, making it one of the best options out there for divers who don’t want to compromise on performance, but don’t want to go bankrupt. The design and build are not as polished as what you might find in higher-end dive watches. If you are used to watches that cost multiple thousand dollars, you may miss some of the elegance and luxury of those watches. But if you are used to reliable, high-performance watches, you’ll feel right at home using the Prospex PADI Solar. Unlike many other dive watches in its price range, the Prospex PADI Solar handles all of the basics well. The fit is comfortable, the quartz movement accurate, and the solar battery will never fail you. It is one of the best dive watches in its class, and goes toe to toe with watches that cost hundreds more. The Seiko Prospex PADI Solar is one of the best options out there for divers looking for an affordable, full featured dive watch. It won’t give you more than you need, but with excellent core features, you won’t feel like you’re missing anything. It’ll give you everything you need for a dive, and can also be used for a wide range of other activities out on the water. The solar quartz movement is accurate and can charge quickly, the face is readable, and the waterproofing is reliable. You get a lot of utility in an affordable package. Whether you just got your certification or are an experienced diver, the Seiko Prospex PADI Solar should be a watch you strongly consider. Made by a Japanese watch company with roots dating back in the early 1900’s, Citizen’s Eco-Drive Promaster Divers Watch is the epitome of a fully automatic dive watch. Instead of the traditional battery, this popular underwater timepiece is powered by a power cell that is recharged through light exposure and body motion, making this an eco-friendly watch. Further, this naturally powered dive watch means that you will never need to open the back casing making sure that it maintains its factory seal. In short, it is lifetime water resistant. Its internal anatomy is operated through a Japanese quartz movement and encased in a 43 millimeter stainless steel circular case. The watch face is covered by a lens made up of a thick mineral crystal making it capable to be water resistant up to 200 meters (660 feet). As to the rotating bezel, it features a uni-directional bezel with a major 10-degree and a minor 5-degree interval mark making it perfect in marking the start of your dive. The Citizen Eco-Drive Promaster Diver Watch can be fully secured on your wrist via its black-colored polyurethane strap with a stainless steel buckle. The time index, hour and minute hand are highly luminous. Many of its users appreciated this dive watch during a night dive where a single beam from its underwater torch would mean minutes of nonstop glowing making it easy to read the time. In fact, many have said that they can differentiate the glow movement of the hour hand between the minute hand and second hand. And lastly, while it seems that this compact dive watch looks heavy, it actually only weighs 16 ounces and wearing it virtually becomes an integral part of your wrist. Founded as a joint venture between Japanese and Swiss watchmakers, Citizen blends watchmaking expertise and mass-manufacturing to produce well designed but affordable watches. The Citizen Eco Drive Promaster is a fully featured dive watch that won’t cost you more than a year of your child’s tuition! It’s an excellent option for divers of all different experience levels, as well as those that want a stylish everyday watch. The steel case is not as polished as some other watches, which some users may like, while others may want a bit more shine. It looks solid, however, and is well-built. The face is black, with chrome inset markers for the time. It is understated but elegant, giving it a classic feel. The profile is quite slim, giving it a graceful and understated look that is timeless. The watch is designed for divers, but you would not look out of place wearing it on the street. It’s a bit bigger than a lot of daily watches, but its classic design means it looks just as good in the office as it does in the water. The Promaster is supposed to have a full suite of features for divers. And for the most part, it lives up to that billing. The first thing you notice about the watch is how light it feels on your wrist. This watch won’t slow you down, whether you’re in or out of the water. The hands of the watch are different colors, so you can differentiate them immediately without any issues. They are also well coated with luminous paint, so you’ll be able to see them, no matter the lighting conditions. The watch is highly visible under water as well, so it won’t let you down during a dive. The face is readable, and the the anti-reflective surface does an excellent job of keeping glare from becoming an issue. The markers are all lined with chrome, making every hour easy to make out, as well as giving the face a stylish look. The date marker on the watch is easy to read and the numbers center well. The quartz mechanism is accurate, and over the testing period did not show any deviation from when it was set. The bezel is not as stylish as those that you’ll find on more expensive dive watches, but it performs well and feels solid in your hand. It’s easy to turn, even with the thickest of diving gloves, giving you excellent grip. The bezel shows time over 60 minute intervals, and you can hear a satisfying click as it turns. As you go underwater, it becomes harder to turn, so that you don’t accidentally shift the time. The Promaster is rated for a depth of up to 660. No matter the dive, it should be able to go with you. There were no issues with water exposure throughout any of the testing. The polyurethane band adjusts easily, and fits wrists of all different sizes. It does not rub, so you won’t have any discomfort, even after days of continuous wear. It also has great flexibility for when you are diving, and want your watch to fit over a wetsuit. This strap may feel a bit stiff at first, so give it time to break in. The watch holds up well through repeated use, even in extreme conditions. The face did not scratch, even on sharp rocky surfaces or after being dropped onto concrete. However, the bezel does get a bit scratched up over time. This is not anything much more than standard wear and tear, however, and is not easy to see. The solar powered battery is one of the best features of the Eco Drive Promaster. Occasional light exposure should be enough to keep it fully charged, but make sure that you go out of your way to get it some more light during Winter months. This battery is designed to last for decades, so that you never have to open up the case. Overall, the Eco Drive Promaster offers excellent performance in nearly every category. An accurate mechanism, easy to read face, great bezel, and excellent waterproofing make it a watch that you can rely on. The Eco Drive Promaster is one of the better dive watches available for the price. The price would make you think that it is a budget watch, with all of the tradeoffs that usually come with this. However, this is far from the case. The Eco Drive Promaster performs as well as watches that cost hundreds of dollars more, without sacrificing style, durability, or comfort. The style is clean and elegant. The construction, though never feeling cheap, is not as polished as high-end watches. However, you never feel like the watch you’re wearing only costs a little more than $100. This separates it from most of the other dive watches in the same price point. There are better dive watches out there, and ones that offer many more features. But most of these will cost thousands. For the price, the Eco-Drive is one of the best dive watches. In the world of dive watches, the Jiusko 75LSB08 24 Jewel Automatic Deep Dive Watch is one of the competitive underwater timepieces out in the market but on a relatively cheap price. This China-made dive watch is one of the lightest timepiece which only weighs 3.68 ounces courtesy of its titanium alloy casing. Nonetheless, being a lightweight timepiece does not compromise its quality as it features several high end components. Its internal components comprises an automatic and accurate NH36 beat that is derived from the technology of Seiko. In case of prolonged storage, this automatic mode allows you to set the time motion automatically by winding the crown where a full wind is equivalent to 40 hours of nonstop time hand beat. This timepiece has a time lapse rotating bezel that is made from scratch resistant ceramic, a crystal face cover which is derived from a scratch-proof high quality sapphire, a stainless steel crown screws with a double down o-rings which makes the entire timepiece waterproof for a lifetime. The Jiusko 75LSB08 24 Jewel Automatic Deep Dive Watch has a long blue-colored rubber strap that is made up of silicone with a stainless steel buckle for securing tight in your wrist which is perfect especially if you are using a thick wetsuit. In general, while the overall look of this particular product will give you an initial impression as being a fancy underwater timepiece, make no mistake with your initial observation as this dive watch has one of the deepest water resistant features where it can go dive up to 300 meters (984 feet). Made by one of the oldest Japanese watch maker, the Orient Ray II Japanese Automatic Stainless Steel Diving Watch persistently sits on the top 10 list of diving watch under $1,000. Having a dimension of 43 millimeters case diameter and 13 millimeter thickness, this dive watch is one of the most compact timepiece you can have. But being a compact unit does not mean that it does not have the features every dive watch must have. The Orient Ray II Japanese Automatic Stainless Steel Diving Watch is powered by a 22-jewel, Caliber F69 automatic movement that can be self winded. Re-designed from its older version, the new Orient Ray II dive watch has an improved uni-directional bezel that has a clicking sound every time you move a degree. Its new case design has a trim and simplified look which retains the old day and date window. Its elegant bracelet is made of stainless steel that has the push-down deployant clasp which is a hallmark feature of all Orient watches. Most of its users appreciate its superior water resistance where its 200 meter rating has become the perfect timepiece for deep diving. Another feature of the ​Orient Ray II Japanese Automatic Diving Watch where customers love is the adjustability of its bracelet. Initially, while every diver has a different size in terms of wrist diameter, the band of this particular underwater timepiece can be adjusted with the removal or addition of metal links. Manufactured by one of Canada’s biggest watchmaker, the Momentum M1 Deep 6 is one of the highly preferred dive watch dive professional wear on their underwater adventures. This solar powered timepiece has a long power life where it can run for days without the need for sunlight exposure. What really stands out with the Momentum M1 Deep 6 is its answer to oversized dive watches where it can fit most large wrist and perfect for wearing with thick wetsuit or drysuit. Its 48.6 millimeter diameter case is one of the largest dive watch available and houses a huge time dial design where all its hands have a neo-brite luminous color when illuminated in the dark. Many of its users have claimed that the luminous hand characteristics of the Momentum M1 Deep 6 is one of the brightest in today’s market. On top of this, on the absence of an underwater flashlight, this underwater timepiece can illuminate itself using its built-in LED light where a single push of the button has an afterglow of over a minute. “My wife told me that if I continue diving, she will leave me. Oh boy, I’m gonna miss her”. While that funny quote happens to some divers, we don’t want that to happen and ruin our family lives. We both love diving, our wife and our family. So, in order for your wife to be happy the moment you leave the house for a diving expedition, give her a dive watch like the Momentum M1 Mini Women’s Dive Watch, and tell her you will be back the soonest possible time. Kidding aside, the Momentum M1 Mini Women’s Dive Watch is not just a bribe for the wife, but really a high precision underwater timepiece that has been used by most female divers. Some have said that it is the female version of the Momentum M1 Deep 6 where it features the same time characteristics, but encased in a smaller size at 31.1 millimeters in diameter and only weighs 6.4 ounces. Now here’s the thing: if you are diving couple and your wife or partner goes diving too, then having the Momentum M1 Deep 6 for you and the Momentum M1 Mini Women’s Dive Watch for your partner is just synonymous in wearing a wedding ring. At a single glance, you will see that this Japanese dive watch looks ordinary. Ordinary in the sense that it has the standard features most dive watch have. It has a stainless steel case that houses a Japanese quartz system that is run by a light-powered cell, a date window, reverse crown with push levers, uni-directional bezel, brightly luminous time hands and a water resistant rating of up to 200 meters (660 feet). But this initial impression of the Citizen Eco-drive Promaster Aqualand Depth Meter Dive watch will change once you start wearing it. The moment this particular timepiece is placed on your wrist, you will notice its oversized case that measures 53 millimeters in diameter, which is considered one of the biggest dive watch in the world. Now, here’s the thing with the Citizen Eco-drive Promaster Aqualand Depth Meter Dive: as the name suggest, it has a built-in depth gauge. Many of its users have appreciated this feature as they no longer need the presence of a depth gauge that is usually integrated in the console together with the submersible pressure gauge. As compared to a traditional stand-alone depth gauge, many have considered the built-in depth gauge of the Citizen Eco-drive Promaster Aqualand Depth Meter Dive Watch an inferior feature as it can only measure up to 70 meters (230 feet). But come to think of it, 70 meters is way beyond the limits of recreational diving as we are only allowed to descend up to 42 meters (140 feet). This is the reason why the Citizen Eco-drive Promaster Aqualand Depth Meter Dive Watch is a best-seller for newbies and beginners where most of their profile are limited to a shallow dive. Looking at the product brand, you may ask yourself: they’re known to make high quality Swiss Army knives with multiple-micro tools as being popularized in an 80’s TV Adventure series. . . . and now they’re making dive watches too? Yes, and not just an ordinary underwater timepiece, but a high precision instrument that stands out from its competitors. Allow us to leave the features of this watch for you scrutinize as its function and characteristics are as nearly as the same with every other dive watch in the market. But what we would like to point out is that among the dive watch in the market under the $1,000 price tag mark, the Victorinox Army Dive Watch has the greatest water resistance rating where this highly durable underwater timepiece could explore the abyss depths of up to 500 meters (1,640 feet). The above-stated dive watches are considered your traditional dive watch. But on the next series, you will find some technological advancement such as the chronograph series. Designed and made by a Japanese Electronic company, the Casio MTD-1060-1AVDF is one of the modern dive watch with a chronograph that features an hourly, day and date subdials. Its internal components features a quartz moving timepiece that has an analog display and a wave pattern dial that is encased in a 47 millimeter stainless steel case with a protective mineral crystal face cover. Aside from its uni-directional bezel that highlights the first 15 degree mark with a 5 degree mark interval afterwards, it features a fold over type of clasp that has double push button function for added safety features. Most of its users have appreciated its elegant look courtesy from its metal band. Its 26 millimeter stainless steel band really stands out when compared to the polyurethane or rubberized straps where its shiny silver colored straps would mean that it can also be worn on formal occasions. While it seems that all the features of the Casio MTD-1060-1AVDF dive watch would be the perfect gift item for your male partner, dad or your male buddy, many have told us that this timepiece has a very poor packaging that it does not have its own protective shell. Nonetheless, what we are after here is the quality of the timepiece and not its packaging. When compared to other dive watches, the popularity of this Chinese made underwater timepiece is growing and competing with the global market for several reasons.First, while it has almost the same case diameter with other dive watches at 43 millimeters, ths Jiusko 76LSB08 Deep Sea Titanium Quartz Dive watch has a thicker casing measuring 16 millimeters. This means that it houses more internal components where one of its feature is a fully functional chronograph that features an hour, day and date subdials with an artistic 3-dimensional rotating hand. Many of its users have observed, during night dive, that a single glance of a flashlight beam creates a highly luminous dials that can be visible for minutes. Its external anatomy includes a uni-directional bezel that is embedded in a ceramic component, scratch resistant sapphire crystal face cover, a stainless steel crown that is equipped with the state-of-the-art helium valve which acts as a pressure relief when a diver goes deep diving on an extended underwater time profile. But what really stands out about the Jiusko 76LSB08 Deep Sea Titanium Quartz Dive watch is the titanium case material. Even if it is bigger and thicker when compared to other brands and model, it has a lighter weight where this timepiece only weighs 4.96 ounces. Another stand-out feature is its deep sea capability where this particular dive watch has one of the deepest water resistant capability that can go as deep as 300 meters or 984 feet which fully justify its helium relief valve feature. And lastly, while this dive watch is made in China, it does not mean that it has a cheaper price as this is one of the few high-precision timepieces that goes near the range of the $1,000 price tag. Orient M-force Bravo is one of my favorite watches on the market. I love the stainless steel and orange face. I admit, it is not for everyone but it grows on you to love for sure. The case diameter is 45 mm and there are lots of subtle details that really pull the watch together. It is good to 660 feet and is a Japanese automatic movement so you never need to change the batteries! Great for high impact sports in the water but not recommended for depths of mixed gas. Alpina Seastrong is the classiest watch that we have to offer under 1000.00. It has 48 months of battery life which will last you for years. It is water resistant up to 984 feet so you cannot break any world records with this watch but you could come close if you tried! It has AL-372 high precision quartz chronograph caliber. Uni directional quartz bezel, stainless steel and 3 sub dials with 60 second, 30 minute, and 1/10 second hands. Scratch resistant face and screw down crown. The price on the watch really gives you a great bang for your buck and from office wear to dive wear you cannot loose out on this beautiful watch. For those comparing Citizen watch vs Seiko - The Seiko Automatic Divers watch comes in at our best price yet especially for those looking for the watch well under 1000.00. Seiko has years of quality experience in watch making and they have never stopped reinventing themselves. The automatic function means that you will never need batteries ever again! As I mentioned earlier I have so many watches that constantly need batteries but if you are one of those people who only have one or two watches batteries should NOT be your concern. If you are like myself and have lots of watches the automatic function works great because all you need to do is move the watch around a little bit and away you go! It has a hardlex crystal and case diameter of 42 mm so it is great for almost anyone unless you are a tree removal specialist in which your forearms are most likely the size of the tree trunks you are cutting down then the watch face might be a little small for you liking. The watch is stainless steel with date and day functions. Water resistant up to 660 feet and great for the recreational diver! The Seiko Marine Master Dive watch comes in at our highest ranked watch for good reason. This automatic dive watch has everything you need and more but of course it comes right at the top of that 1000.00 budget. If it is a little out of your price range, look at the next watch up which is still great but here I will tell you what else you are getting! First of all you get a 2 year amazon warranty which is very unlikely just in case anything does go wrong which it won't but just in case. It is stainless steel with a 47 mm diameter so it is a little bigger but still looks great on small wrists as well (like myself). The band is rubber which I find nicer because when you are in salt water diver, snorkeling and surfing its easy to clean off and doesn't get that build up that some watches do when they are all stainless steel (I also rinse my thoroughly every time I am out of the salt water). It has a bezel uni directional function with date and analog quartz movement. It goes up to 990 feet so if you are attempting a world record you will be close but not quite there. Still a very good watch! Longines Hydroquest Dive watch is your sleek classic stainless steel dive watch. As your all around into business meetings to hitting the beach or diving this will hold up against it all. The face is scratch resistant so good for anyone who is quite active and clumsy we can say. It has a 41 mm face and unidirectional bezel. One of my favorite features is the deployment buckle making it easy to put on and take off. This can make it a little more difficult if you are wearing a wetsuit though so just air on the side of caution if you are diving with a wetsuit. The date clock is displayed at 3 o'clock for easy reading. By this time, you should be aware that there is a big difference in using a dive watch on land compared when using it for your underwater adventures, even if we focus our discussion on the simple topic of strapping and location on the wrist. The first notable difference is that you will be wearing exposure suits during diving and that you need to put on the dive watch straps after you wear the wetsuit in such a way that the dive watch is above the suit. The answer depends on your preference or whether you are a left-handed or a right-handed person. However, what is important is the placement of the dive watch in relation to other diving instruments like dive computers and compass. A dive watch should be a stand alone equipment and should never be mounted with other instruments as this may disrupt its operational mechanism and vice versa. For example: if you are a left handed person (like me) and prefer to wear a dive watch on the left wrist, I make sure that my compass or dive computer should be worn on the right wrist. Let us assume that you have properly worn the dive watch and that you are ready for an adventurous dive. On the way to the dive site, most newbies will just take note of the time without realizing that the possibility of forgetting what time they start diving is relatively high. Not unless you have a slate board to record the time of your dive, you will often forget these information as you will be amazed on what you will see underwater, ending up in estimating the time when you started diving. And we tell you, this process is tedious and sometimes frustrating. Now here’s a simple way to mark your underwater time: USE THE ROTATING BEZEL TO MARK YOUR TIME. Depending on the brand and model, some rotating bezels can be rotated either clockwise, counter-clockwise or both. But ideally, the rotating bezel should only be moveable on a single direction, not multi-directional. As you enter the water before the start of your descent, move the rotating bezel in such a way that its zero mark gets in line with the minute hand of the watch. Take note: not the hour hand, not the second hand but the minute hand. It is illogical to place the zero hand of the rotating bezel to the hour or second hand of the watch as most dive durations last in minutes and not in hours or seconds. Important reminder: you have to take note or record the time elapse before you exit the water as you finish the dive by deducting the minutes elapsed from the time you exit the water to the time you started the dive as benchmarked by the zero mark of the rotating bezel. Given the fact that most material casing of dive watches are made of stainless or high performance steel and that you don’t need to worry about corrosion, you still need to perform some post dive care for your watch to last long. Like any other scuba equipment and instruments, you need to rinse your dive watch with freshwater. But it would be better if you soak and immerse it for several minutes allowing salt deposits to be completely eliminated. Do not open any operating ports while rinsing or soaking in freshwater, otherwise, you will expose your timepiece to flooding. And lastly, clean with a dry piece of cloth before you wear it back or store in a cool dry place. A good dive watch not only needs to be able to tell you the time (how long you have actually been on your dive), be able to hold up against the pressure of the water and to get a little more specific in the next paragraph about why the watches need to be built well is. When diving every 10 m or 33 feet the ambient pressure increases 1 ATM or 14.7 psi. At sea level we are breathing and living at 1 Atmosphere (ATM) so going down to 30 meters (99 feet) we are now at 4 ATM. Water weighs 64 pounds per cubic foot so every time you submerge 1 foot and then keep doubling from there. That is a lot of pressure not only for us (we do it controlled so we have nothing to worry about) but for a watch that is poorly made, you will have now just wasted your money. I hope that wasn’t to boring but it puts perspective on diving. Depth - Firstly you want to find watches that say “Water Resistant” because these are the watches that are able to withstand the pressure of the atmosphere when you are diving. When you see a watch that is “Waterproof” they not are geared for diving! Waterproof watches are fine for snorkeling, showering, swimming and sometimes being in the salt water but be cautious especially with the cheaper watches because it may be a throw away at the end of the day. If the watch says Divers 100m they are minimum standard (ISO 6425) but will work great and Divers 200m and 300m and suitable for everything but very deep depths. Divers 300m are suitable for saturation diving. Water Resistant watches will say to what depth that can reach and most watches usually have a 100m depth rating however, it is unlikely that you will be going past 30-40 meters as a recreational diver anyways. As mentioned all watches are different so when push comes to shove get a watch with a higher water resistant rating! Bezel Markings - A bezel is the ring located on the outside of the watch around the face. It will have markings and can move one way, both ways or it will be fixed. Having a good bezel is key and you will want one that moves unilaterally so it cannot get turned back just in case you brush up against something and it turns. Better to shorten your dive moving one direction than the other. The function of the bezel is to track elapsed time so when you are diving you know when you entered the water and have a measuring point to elapse your time underwater. Watch Casing - If you are diving in the ocean which you will most likely be you will want stainless steel with titanium, ceramics and synthetic resins. Metal is a fine material as well but make sure it has other materials built into it as mentioned earlier. Not only should the material be solid but it should be put together tight as well so there is no leakage with the pressure of the water with good screws and a solid seal with on a watch will be an O-ring seal as well. The face will most likely be a acrylic glass for hardness and quality. How to buy a dive watch? There is no point for a dive watch if it is not water resistant. A true and reliable dive watch must have at least an ISO 6425 standard certification. This means that the timepiece and its components have been tested to be water resistant to a depth of at least 100 meters or 330 feet. The general rule is: the deeper the water resistance, the better. Most recent brand and models offers deeper water resistance where a 200-meters (660 feet) water resistance feature is now common. For a newbie, this two may sound the same. 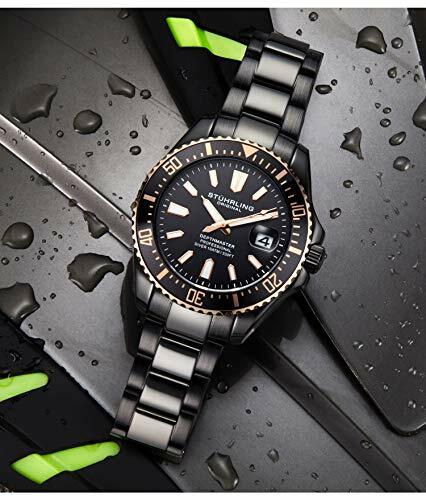 But for an experienced diver, a watch that is water resistant is totally different from a watch that is waterproof. Being a water resistant watch means that it can withstand long hours of direct immersion in water coupled with environmental factors such as temperature and pressure which is very evident when you go diving. On the other hand, waterproof watch has a minimal threshold point, that once it is exceeded, water may enter the timepiece. Such waterproof watch is only good for rainy and shallow water conditions. So, do not buy a dive watch that is not a water resistant certified. Most of the diving environments we are exposed to are saltwater ecosystems which means that salt, a highly corrosive compound, is perpetually existing. Therefore, it is imperative that the material of our dive watch must be corrosion resistant. Most dive watch casings are made up of high grade stainless steel or even titanium. These premium metals are also used in the dive watch band or maybe fitted with a silicone or hard rubber. Crystal and minerals may be added to the internal components of the dive watch in exchange for the parts that may potentially be corroded. Some of the common internal addons are sapphire and mineral glass. Not unless it is a digitally operated dive watch, all classically made dive watch has a rotating bezel. But not just any rotating bezel. While there are some dive watch with a multi-directional bezel, what we recommend though is a uni-directional bezel. But why uni-directional and not multi-directional? Uni-directional dive watch bezels can only be rotated in a single direction, either clockwise or counter-clockwise depending on the brand and model. This means that the possibility of an accidental rotation is lessened as compared to a multi-directional bezel. Common instances of an accidental rotation is the touching of the bezel to the wetsuit of the opposite wrist. In case you are in a dive shop or in a watch store while trying on your selected dive watch, you have to remember that you need to reserve some extra band length and having the exact band length to the circumference of your wrist is not advisable. The main reason for this length reservation is that it will be the space reserved once you put on the wetsuit. Example: If you are traditionally wearing a 3mm wetsuit, then you need to compensate the length of your dive watch band as wearing the wetsuit will create an automatic 3mm additional circumference to your wrist. And if you frequently change from 3mm to 5mm wetsuit, as the need arises due to environmental and diving conditions, then you need a dive watch that has a band length suited for a 5mm wetsuit. There will come a time that the need to go night diving is inevitable, may it be for recreational, commercial or professional reasons. But nonetheless, all these kinds of light-restricted diving requires a dive watch that has a luminous time index. Please take note that what we are talking here is not about pressing that dive watch button and an illumination will reflect the internal surroundings of your dive watch. What we are talking about is that with the use of an external light source (like an underwater torch or flashlight) and directing its beam to the dive watch, the time index will become luminous and that it will glow in the dark for several minutes without the need of a light source. A good watch will obviously tell the time, date etc... but with a dive watch you need just a little more than something telling you the time. It has to be able to withstand the pressure of the water as you go down into the sea. Most often you will be diving in the ocean and you will need something that will be able to go into salt water. You will need a watch with good material and of course always rinse your watch out in fresh water after every time you do go in the water just to make sure. As you submerge yourself in the water every 33 feet the ambient pressure increases 1 ATM or 14.7 psi. On land or at sea level we are breathing at 1 Atmosphere (ATM) so going down to 99 feet we are now at 4 ATM. Water weighs 64 pounds per cubic foot so every time you submerge 1 foot and then keep doubling from there. That is a lot of pressure for a watch. We are fine with our air and controlled stops etc... That puts things into perspective when you are looking at a watch that is good quality. You can even get a good cheap watch that works great to but usually it does not look as good or classy. The world record for deepest depth was 1090 feet by Ahmed Gabr who is the world record holder. It also took him 15 hours to resurface so unless you are planning on that I wouldn't worry about it to much. Read carefully because some watches say that they are water resistant to X depth but then they say "not suitable for scuba diving". So you can take them in the water but not diving... Doesn't make sense right? Some will say good for recreational diving and that will be fine for anyone who is not a commercial diver. Bezels are on all dive watches and if they are not they are not good dive watches. They are a ring on the outside of the watch that will have a marking moving unidirectional or both ways. You want one that is unilateral and it is tell tell what time you exactly got into the water. This feature is great because if you brush up against something you don't want it to switch around and then all of a sudden you are not sure how long you were actually down for. Watch casings are very important for people who are diving. The very specific reason is so that the watch doesn't leak and wreck you watch! seems simple enough right... It is. Make sure it has good screws and an O casing for sealing protection. All you really need to know about that! So as you can see there are lots of great watches under 1000.00 that won't break the bank. You can get classy for both office and fun or one for each occasion. All of these watches are highly recommended and will last. If you are active though I recommend getting a scratch resistant face. Make sure they are water resistant and if you are dive master or commercial diver I will also check out something with the specs of a dive computer. Regardless all of these watches will last and you will look great doing whatever it is that you are doing! If you are like most of the world now the newer generations don't wear watches to know the time, it is more of a style piece than anything else. Everyone just looks at their phones... I am not one of those people, I own way to many watches that sometimes it is tough to keep the batteries working in all of them. Next off, I love watches and cannot get enough of them. The best part of this article is that you can get a lot of nice watches for under 1000.00 and when you go over 1000.00 you are paying for the name and a few nicer pieces, such as jewels and material. Some have batteries, some are kinetic (they are powered by your movement and some are solar (powered by the sun) which is great in the Caribbean or other tropical hot sunny places! If you are an avid diver or even once in a while, I highly recommend getting a watch that you can use all year round and that you like! OF course looks matter with watches and it depends on what you wear with the watch because obviously you have to accessorize. You will want a watch that looks good and goes with your work attire and then when it is time to go diving you can just keep going and never have to worry! Before we end this article, allow us to remind you that no matter how precise your preferred underwater timepiece, it does not mean that you will no longer follow the rules set by the Recreational Dive Planner (also called as the Dive Table) in terms of underwater time. YOU STILL NEED TO DIVE WITHIN THE LIMITS. Your dive watch is only an instrument to guide you in determining your bottom time and prevent incidence like nitrogen narcosis and/or decompression sickness.